(CNN) -- Hondurans divided over an ongoing political crisis agree on one thing -- they don't think very highly of their leaders, according to a new survey. Almost half of Hondurans polled -- 48 percent -- said they disapproved of the job President Jose Manuel Zelaya was doing before he was ousted in a coup on June 28, said the 2009 Latinobarometro survey. The man who assumed power after the coup, de facto President Roberto Micheletti, received a disapproval rating of 65 percent for how he has handled the crisis, according to the survey. The annual Latinobarometro survey, named after the Chile-based non-profit company of the same name, is among the most highly regarded polls in the region. This year, the poll asked a number of questions that shed light on how Hondurans and other Latin Americans viewed the political crisis in Honduras. A new Honduran president, Pepe Lobo Sosa, was elected last month, though the international community is split on whether to recognize him because the vote took place under the rule of the de facto government. An agreement between negotiators for Zelaya and Micheletti had been reached earlier, but lost much credibility when its implementation didn't go as planned. Zelaya, who remains holed up inside the Brazilian embassy in the Honduran capital ever since covertly sneaking back into his country in September, has called the plan dead. Several attempts to find a resolution failed, despite strong international criticism of the coup. "It can be said that the force of rejection of all the international organizations, which were raised in a singular voice against the coup and in favor of the restitution of the constitutionally elected president, were ineffective against the local political forces that had expelled Zelaya in an ignominious manner," the survey said. The political crisis stemmed from Zelaya's desire to hold a referendum that could have changed the constitution to allow longer terms for the president. The country's congress had outlawed the vote, and the supreme court had ruled it illegal. Micheletti and his supporters say Zelaya's removal was a constitutional transfer of power and not a coup. According to Latinobarometro, 58 percent of Hondurans disapproved of the coup, while another 28 percent said they approved of Zelaya's ouster. Those more heavily in favor of the coup included those with a higher education and the elderly, the survey found. Of those with university degrees, 40 percent approved of the coup, compared with 27 percent approval among those with only a basic education, the survey said. Zelaya faced long odds of returning to the presidency because the supreme court and congress, including lawmakers from his own party, were against his calls for the referendum that led to his ouster. These political power brokers, and in general, the Honduran elite that backed Micheletti, likely account for the discrepancy between education level and views of the coup. In Honduras, the elite are more likely to have completed university than others. The low approval ratings for Zelaya point to his thin election victory in 2005, according to Latinobarometro. 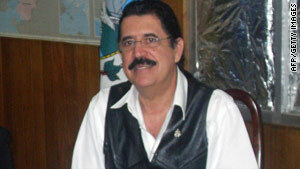 The leftist Zelaya was elected with just under 50 percent of the vote. That margin hardly gave him a mandate to push the sweeping constitutional reforms he wanted, the survey said. "Manuel Zelaya wanted to implement reforms that were beyond what the majority supported," the report said. Outside of Honduras, 24 percent of respondents in the other Latin American countries approved of the coup, the Latinobarometro survey found. Asked to rate Honduran democracy on a scale of 1 to 10, those outside of the country said the Central American nation merited a 5.2, the survey said. It was the first time that the firm asked for people to give their perception of democracy in a country that was not their own. Latinobarometro also asked respondents in the region whether they believed a coup was possible in their own country. The highest affirmative responses came from countries that have left-leaning presidents. Ecuadorians (36 percent), Brazilians (34 percent) and Venezuelans (30 percent) said a coup was possible in their country.